The beautiful and elegant sign above features engraved V-carved text, a V-carved border, and a smooth wood background .The art (pineapple) is carved in 3-D and 24K gold-leaf gilded, as is the text. 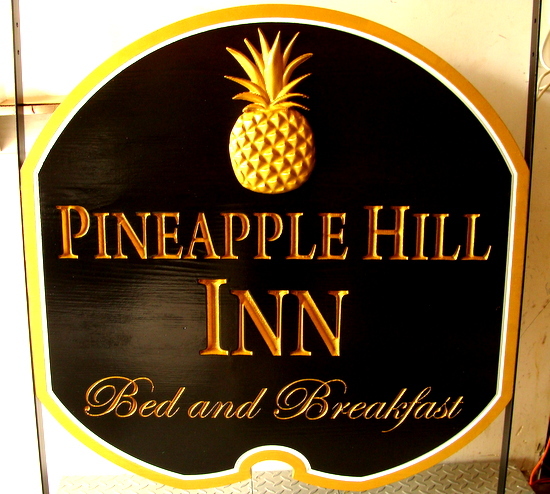 This attractive sign and similar ones can be made of stained and painted wood , or painted HDU. The sign is hand-painted , and then clear-coated, This sign can be easily mounted on an outside wall, or hung from the ceiling or an iron hanger, or placed between two posts outside.